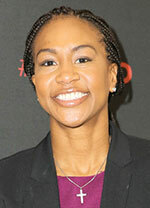 Four-time Olympic gold medalist Tamika Catchings will be the featured speaker at the archdiocese’s 19th annual Spirit of Service Awards Dinner in Indianapolis on April 26. Before retiring this past season, Catchings made a tremendous impact during her long career on the basketball court—both for the U.S. women’s basketball team in the Olympics and in leading the Indiana Fever to a championship in the Women’s National Basketball Association. She also continues to make an inspiring difference off the court as the founder of Catch the Stars Foundation, which helps young people pursue and realize their dreams. The Spirit of Service Awards Dinner will benefit and celebrate the efforts of Catholic Charities Indianapolis to help people in need. It’s also an opportunity for business, community and social services leaders to support Catholic Charities as it continues to improve the community of central Indiana by providing services to the poor and vulnerable. The event at the Indiana Roof Ballroom begins with a reception at 5:30 p.m., and dinner is at 6:30 p.m. Tables for eight can be purchased at these sponsorship levels: $10,000 for a benefactor, $5,000 for a patron, $2,000 for a partner and $800 for a non-profit. Individual tickets are $125. In 2016, Catholic Charities Indianapolis served about 75,000 people. The agency ensures that 92 cents of every dollar goes directly to programming.